One of the Foremost figures in the modern remaissance of Indian Painting. He is not only the leader of the so called Bengali School of Painting but is also recognised as one of the Master artists of the World. Following paintings of Sri Nand Lal Bose is available in the library. Woman opening the door having a pitcher under her arm pit. He is aproduct ofKala Bhawan, Shantiniketan. He was Principal, Govt. School of Arts and Crafts, Lucknow. He is one of the representatives of Bengal School of painting and has been student of Arvinda Nath Tagore. He is famous as fresco painter. Prsian by tradition and Moghul by birth Chugtai brings to the art the delicacy of line and fine finish of Indo Persian Art. These pictures in the library were presented to us by Late Mr. D.N. Bonarjee. He was famour as a Painter, Graphic Artist, Sculptor and a Photographer. He was Principal of Govt. School of Arts and Crafts, Lucknow. He had been a student of Royal Academy of Art. His discipline on the acadmic school of painting is exceptional. He had a formidable influence on his students like M/s M.L. Nagar, R.S. Dixit, Frank Wasley etc. His portrails and landscapes, besides being realistic are vibrant with life. He has done impressionistic work also. He is a product of Kala Bhawan, Shantiniketan. He was Principal of Govt. College of Arts and Craft, Lucknow. He has made significant experiments in broad lines and is known for spontinity of expression both in painting and sculpture. He is one of the pioneer of Art Education. He was awarded PadamShri. He is a product of govt. College of Arts and Crafts, Lucknow. He is famour for transparent water colour and landscapes. His painting of Banaras Ghat is famours. He was product of Govt. College of Arts and Crafts, Lucknow. He also served this College for 15 years. He was famous for portrail painting and landscape in water colour, oil colour and pastel colour. He is an Artist of the modern Lucknow School. He has been working Publication Division of Ministry of Informatio and Broadcasting, Govt. of india. He is famous for western style wash painting. He is a product of Govt. College of Arts and Crafts, Lucknow. At present he is working as Lecturer of Drawing and painting in Ajmer Degree College. He is the product of Govt. College of Arts and Crafts, Lucknow. At present he is working as Head of the Department of Fine Arts in College of Arts and Crafts, Lucknow. He is known for his simplified landscape and expressive portraits and is largely impressed by Late Sri L.M. Sen. The present Principal and the Dean, Faculty of Fine Arts is the product of Govt. College of Arts and Crafts, Lucknow. He is eminet modern Indian painter. The library has three paintings of Mr Bisht. He is a promissing artist. His paintings Landsdown under snow fall" and Sunset on hills" are famour paintings. He has ben participating in exhibitions and has been awarded prizes. He is product of Kala Bhawan, Shantiniketan. At present he is working as Head of the Department of Sculpture, College of Arts and Crafts, Lucknow. He is famous as Sculptor and Painter. He is a product of Govt. College of Arts and Crafts, Lucknow. At present he is working as an Artist in State Museum, Lucknow. He is Master of Miniature painting. He is at present workingas an Assistant Professor in the College of Arts and Crafts, Lucknow. He is signifucant young exponent of Wash stule and has made new experiments in it. He is a product of Govt. College of Arts and Crafts, Lucknow. He is product of Govt. 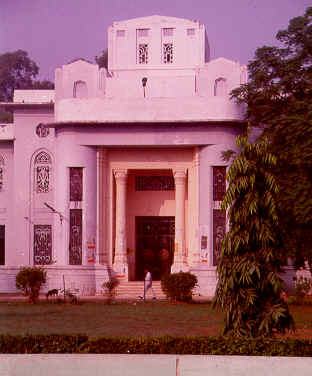 College of Arts and Crafts, Lucknow and is recognised as a significant wash painter.